As a light sport pilot is a Bi-Annual flight review required? Yes, it is all spelled out in CFR 61.56. If you are a sport pilot it must be done in a light sport aircraft. If you hold other than a sport pilot certificate you can do it in any aircraft you are rated for. In that case the instructor must be able to act as pilot in command if you can not. Keep in mind it is not a test and you cannot "fail' it. Since you are paying for 2 hours anyway, 1, ground & 1, flight, put it to good use! Tell the instructor about any area that you are not comfortable with so he can work with you during the flight to include that area. You are there to demonstrate your competency as a licensed pilot. You can't fail, but you won't get signed off if you are significantly rusty and/or unsafe at the discretion of the CFI. Jim Hardin wrote: Keep in mind it is not a test and you cannot "fail' it. That’s true, but if the CFI has concerns he could decline to sign off the flight review endorsement. Usually this will be because there is something he wants to work on some more with you, which might cost an hour or two of additional training time. But if he really thinks you are a menace, he could outright refuse to sign you off, and you’d have to pay for another flight review (presumably with another CFI). Or get some dual to get yourself back up to speed. Then retake the flight review with him or someone else. Or you can participate in the wings program, do your 3 hours of flight training in place of a flight review. That way you are legal to fly whether you are proficient enough to have a flight instructor sign off a flight review. 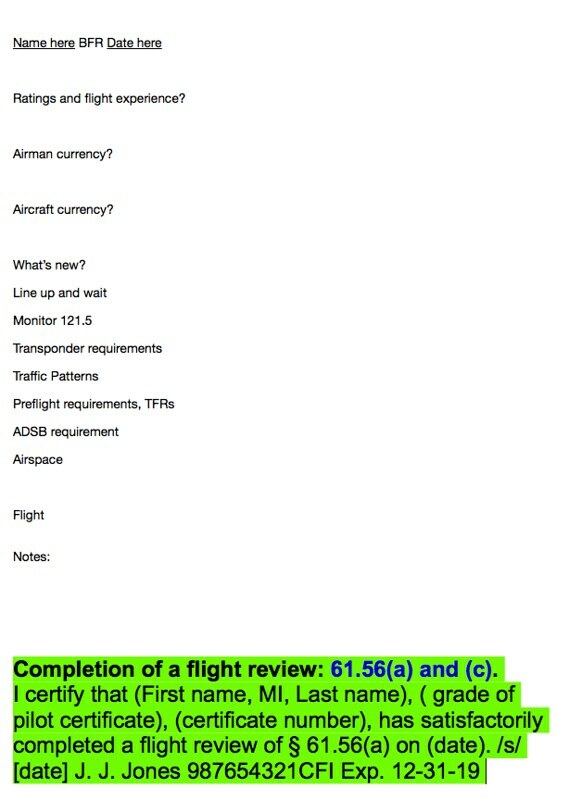 I did an EAA webinar a couple of years back titled "Reviewing the Flight Review." You can find a link to the video on my website, at http://avsport.org/webinars. Thanks for the link, Paul. I'm due for my flight review this month, so the timing is perfect. I just recently started giving flight reviews again recently, giving 3 in the last several months, in a Mooney, a C120 and an RV12. I try to glean areas where pilots in general may be a bit deficient. I get this from forums, EAA meetings and face-to-face discussions and "hangar talk". As far as the flight goes, I try to customize that to the pilot's experience level, aircraft and stated needs. I usually have them plan a very short cross-country and do at least one simulated engine out from directly over an airport. If it counts for anything, I've been told the pilots got more from our time together doing the BFR than they got out of prior BFR's, which the felt were fairly perfunctory. Just had my first BFR yesterday. Fortunately, my former instructor was available and willing. He was concerned that no one at the flight school would want to fly in my E-AB and they would make me use the Skycatcher(which I've only flown in once). It was getting bit windy favoring runway 24. He sees I'm using my checklist and asks if that's just for his benefit. I say, no, I actually use it all the time. We takeoff and he has me fly to Gabreski. Of course their runway 24 is closed, winds gusting to 20 knots and we have to use 19. Good he says. Crosswind practice. We do a few stop and goes and then off to the practice area along the South shore of Long Island. According to my GPS my ground speed is a whopping 37 mph. And this is why I don't normally fly on windy days. He has me do stalls and then the engine out drill. Then back to Brookhaven for some touch 'n goes. All in all he was satisfied that I hadn't picked up any bad habits and he signs me off. My flight review is in two week at KHKY in Remos GX. I usually just read through Part 91 to refresh my memory. This time, since it's in the Remos GX, I booked an hour of solo time a few days before my flight review just to make sure I remember where all the knobs and buttons are. Two years ago, he asked me to dial in a VOR and intecept a radial so it took me a while to figure out how to do that with the Dynon and Garmin SL30 in the airplane. I hadn't used VOR in about 10 years. rcpilot wrote: Just had my first BFR yesterday. Fortunately, my former instructor was available and willing. He was concerned that no one at the flight school would want to fly in my E-AB and they would make me use the Skycatcher(which I've only flown in once). It was getting bit windy favoring runway 24. He sees I'm using my checklist and asks if that's just for his benefit. I say, no, I actually use it all the time. We takeoff and he has me fly to Gabreski. Of course their runway 24 is closed, winds gusting to 20 knots and we have to use 19. Good he says. Crosswind practice. We do a few stop and goes and then off to the practice area along the South shore of Long Island. According to my GPS my ground speed is a whopping 37 mph. And this is why I don't normally fly on windy days. He has me do stalls and then the engine out drill. Then back to Brookhaven for some touch 'n goes. All in all he was satisfied that I hadn't picked up any bad habits and he signs me off. I didn't see any mention of the 1 hour of required ground training.